Light rail eliminates vital lanes for the majority of drivers. The current plan would place it on five of the primary roadways in Nashville. If turn lanes and the ability to cross over to enter parking lots becomes blocked, do you really think this will lower traffic congestion? Not only will we be losing available lanes for traffic, the majority of commuters don’t live or work near these proposed routes. Our city is growing so quickly, how can we expect an inflexible rail system to expand with us? There are so many faster, cheaper options. Take the time to learn about alternative options before you vote on May 1st. Did you know that according to an MIT study, just 2,000 ten-passenger vans using rideshare technology could replace 95 % of the taxis in New York City? This is with a population 10 times as larger than Nashville. Did you know that that vans are already replacing the buses in Arlington, TX? For less than $40 million, we could lease 1,000 vans and have the ability to transport at least 100,000 passengers only operating 8 hours per day. Just imagine how many we could transport operating 16 hours per day. By using modern carpooling technology, these vans could pick you up and drop you in your neighborhood and drop off at or near your job. All of this could be done for less than $3 per ride. A large portion of our traffic issues are directly caused by the fact Nashville has three interstates all coming together at the downtown loop. As we have become a major logistics hub for the southeast, this has led to a significant increase in traffic at those interchanges. All across the United States and the world, as traffic demands grow these interchanges have become common, and enable a way to streamline traffic flow and maximize the number of commuters. The plan our politicians want us to approve on May 1st costs more than it would to build this type of solution, but does not address the fact that our commuter traffic is only going to increase as the city grows. This is before even accounting for pass through traffic. Want a truly modern solution? As tracking technology and real time data analysis systems have improved, the ability for smart bus systems to increase and decrease route availability on demand has been developed. By utilizing these technologies the efficiency of bus services has significantly increased around the world, but did you know that only $1.1 billion of the proposed $9 billion transit plan is for buses? In cities like Indianapolis, they are able to operate a highly rated mass transit system for around $100 million per year. If they and so many others can do it, why can’t we? Why Vote “No” May 1st. 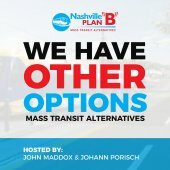 Many cities similar to Nashville have tried light rail, but in almost every case they have suffered declining ridership and significant budget shortfalls. Just as important, these systems have not lowered traffic congestion. The only successful light rail systems are regional, not intracity. The 5 proposed light rail corridors will end 4-5 miles away from the county line. This doesn’t address our regional commuter congestion. We need a regional plan, not a city plan. Most people do not live close enough to the rail lines to justify using it. At a average top speed of 18-20MPH, with many required stops, light rail will not be a faster method of transport. While Nashville is growing rapidly, the light rail system is inflexible and cannot account for inevitable changes in demand. As innovative cities around the country are looking at technology-driven solutions, we are looking to implement an outdated, expensive, and ineffective transit system. Our political “leaders” claim their plan is the only transit solution to address our rapid growth. They want us to commit billions while ignoring the failure of similar models for this proposal. We don’t claim to have all of the answers. There are other “Plan B’s” we need to consider. However, voting for this plan for the sake of “just doing something” is not the answer to a problem that will affect our city for generations to come. Vote no on May 1st. If want you to volunteer, get more information about our events or want to help us reach more people, send us an email or get in touch on social media!